In this article I will show how we can develop an application which performs communication through Sockets. · Creation of a Chat. Visual Studio 2005, Windows Forms and C#. In this article I will show how we can develop an application which performs communication through Sockets. 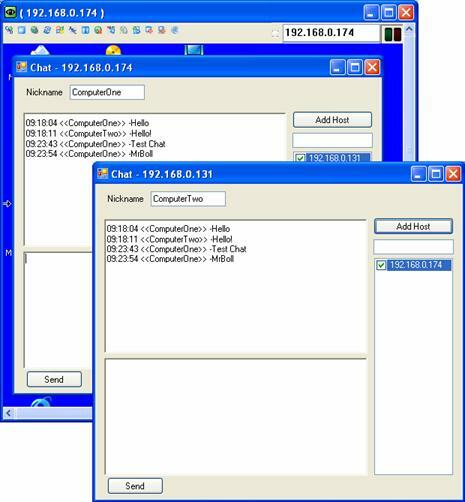 Using Socket it is possible to develop from application servers, such as a proxy, HTTP servers, FTP, P2P applications, Chat, Download Manager among others. To simplify we will put up a project where the communication between computers will be made. Socket is a class that interacts with the IP protocol application layer, where it is possible to communicate with applications and network equipment which will be exposed through a communication port. A great example which we can use is the HTTP servers in which the port made available is the “80”. 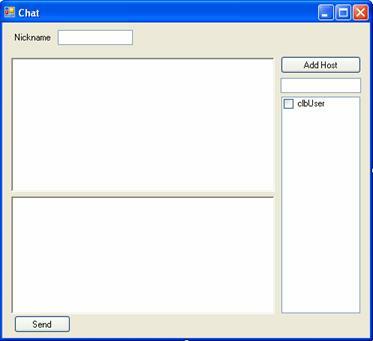 In order to simplify the understanding, I will demonstrate how to develop a Chat through the Socket class. Let us put up an application that will communicate with other remote instances of the same application, through the port 3030. A central server will not be necessary to coordinate the messages. The main functionality of the application is to function as a Chat, this is, to send and receive messages through a network, be it a local network or Internet. See in Figure 1 what the functioning of the application will be like. Notice that it works both as server and client, making a peer the peer (P2P) communication possible. 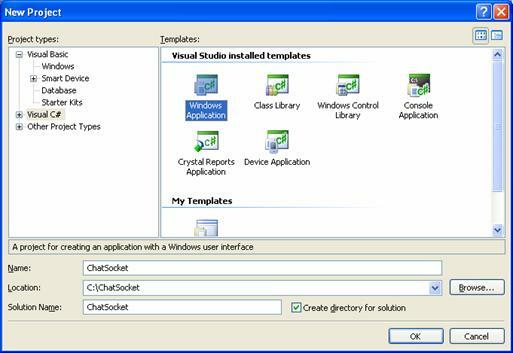 Open the Visual Studio 2005 and click in File>New>Project; choose the item Windows Application in Visual C#, giving the name of “ChatSocket” to determine the name of the application. In Solution Name type “ChatSocket” and click in OK (Figure 2). Initially, the Visual Studio 2005 created some files; we will modify the name of the Form.cs to “frmChat.cs”. Now, we will add some controls before starting the code implementation, as follows in Table 1. The application screen with the controls of Table 1 may be visualized in Figure 3. Now we will initiate the code so that the Chat starts receiving connections from any application through a predefined port. Notice that the architecture used is P2P, where an application receives and sends data without the necessity of a server. In Listing 1 we have the code of the Load event of the form. In the previous listing, the GetHostName returns the name of the machine where the application was initiated and, with this name it is possible to search the IP address through the GetHostAddresses. Notice that we are using an asynchronous call through the HandlerGeneric delegate, this is necessary so that the application can receive “n” simultaneous connections through StartServer. In Listing 2 we have the implementation of this method. The StartServer is responsible for the initialization of the server side. Observe that I am using the TcpListener class which is necessary to initiate the listening of port 3030, which occurs when we execute Start. The delegate HandlerWaitingMessage is used to wait upon any data receiving in asynchronous fashion through the WaitingMessage. Watch that we have an infinite while to wait for some connection to be effected. The AcceptSocket is responsible for the acceptance of the requisition; after the acceptance, the process is paralyzed until a new connection is requested. At this moment, the AcceptSocket returns an object of the Socket type, which is responsible for keeping the channel with the application which requested a new connection, providing the sending and receiving of data through it. In Listing 3, we have the implementation of the WaitingMessage. The WaitingMessage is responsible for the receiving of data. See that the method alone will continue the process if Connected is true, that is, while the client is connected to the application. The Available property indicates if there exists any information to receive after this verification. Notice that we create one Array of bytes with the size that we will be receiving through the ReceiveBufferSize property. With this, the Receive of the Socket class is responsible for the receiving of the data sent to the application. We will implement the method responsible for the sending of the message, according to Listing 4. See that I am performing a new connection through the Connect of the Socket class in the 3030 port, informing only the IP and the port. If the users are not available at the moment of the call, it is removed from the list. The second step is to send the data, typed by the user, to the destination selected in the list of users, where we convert the string generated into bytes. This is necessary for us to use Send which is responsible for the sending of the data. Through Listing 5 implement the ReceiverMSG. In the ReceiverMSG is where we perform the join of the thread, since as the application functions in an asynchronous manner, it is not possible to manipulate directly the controls of the screen, being necessary to perform the join using the Invoke of the form. In the Add Host button is where we add the name of the machine where we want to send the messages to, according to Listing 6. For the Send button, in the Click event, add the code of Listing 7. In order to perform a test, it is necessary to execute the application in two different computers, to perform the communication between both of them. In Figure 4, we have application running, being one executed in a server and having access through UltraVNC, but you can use a virtual machine (VMWare or VirtualPC) to test in the same machine. The article demonstrated how the basic communication is made using Socket, it is possible to use these principles to develop application servers or distributors of any kind of information, for this imagine, ponder and use. Hi mr bool, you have a bug in the code. The TCPListener never get started. You confuse calling the list.Start() with escuta.Start(). Thnks Very Much... Hope this will be useful 4 u. Nice article, will have to check out the bug identified. Downloadable source code/project files would have been very nice. Great article, best I have found so far. hi mr bool,well i have a proble to understand that what is list1,list2 all these,whether the code present inside it is to be write in d same form or in different form in this same project,i understand that the list1 code is to be written on d form_load event i don't know where i have to write d code of list2 & others,plz give proper guidance..Thank u for give us support by this wonderful website..